Ajji, my paternal grandma was the most beautiful lady I have had ever seen. Whenever I think of her, the aroma of fragrant Jasmine wafts away which she would wear on her scented oiled hair combed back in a knotted bun. Most of the times she was seen wearing silk sarees with half a dozen of green and red glass bangles in between lovely gold bangles. While the brightest of bright shade of Kumkum on her forehead always reminded me of bright shining sun, the sparkling diamond studs on her ears and nose reminded me of twinkling stars. Her eyes heavily lined with Kaadige (Kohl/Kajal) would twinkle with all the love and kindness and her beautiful smile would spread warmth in our heart. No wonder my Ajja (paternal Grandfather) fell in love with her the moment he met her when he was just 20 and she just a teen of sweet 16. Amma always would recall how much they were in love even after 50 years of marriage when my Amma became a part of one large joint family as third daughter-in-law and she was warmly welcomed as a daughter by her in laws. Although I don’t remember much about my Ajji, as I was just 5 years old when she left this world, I do remember two things as clearly as if it was only yesterday, one is my Ajji’s cooking and second is every weekend oil bathing sessions. Unlike these days, bathrooms were separate from main house building. We had this huge bathroom built with thick red mud walls and thatched roofs at some distance from the main house. The sun light coming from small wooden windows would compete with the sparkling lights from kerosene lamps. Outside the bathroom there was big granite stone stand used for washing the cloths. The other side of the bathroom had a huge water well which was used for washing and bathing. The bathroom floor was made of thick, rough, unpolished granite stone and had thatched grass roof with wooden beams. At one corner of the bathroom was this huge (I mean really huge) Copper pot fitted to thick mud wood-burning stove and only the mouth of this round pot was visible from outside. Gallons of water filled to the brim from water well next to the bathroom was heated from the bottom by burning the wood which would make the dark bathroom steamy and smoky and lightly aromatic. Although we had dozens of domestic helps and maids at home, Ajji would never leave a chance to give us the oil bath every weekend. First she would change from her silk saree to light cotton one. She would apply warm scented oil on our body and hair and give a thorough massage for at least half an hour starting from head to toe. I would always doze off by this time. Then she would take us to steaming bathroom and make us sit on wooden stool. First she would wash our hair with natural herbal shampoo made using Shikakai and then apply herbal conditioner made from Dasavala (Hibiscus) flowers and leaves. Then she would wash off the oil with a mixture of Gram flour and water rubbing vigorously. By this time we would be content and half asleep. After towelling us dry she would take us to main house to our recreational room on first floor of the house to dry our hair with the Saambhrani Dhoop (Dry leaves of Sambhrani being sprinkled on burning coal in a large clay container and is covered with cane basket). This aromatic, warm smoke of Sambhrani would slowly dry our hair so that we wouldn't catch cold. And then came our weekend lunch time. Green plantain leaves would look like some artist’s palette with colourful dishes adorning them from top to bottom with every kid’s favourite dishes. After a heavy lunch cooked by our Amma, Aunties and Ajji, there was no way we could keep our eyes open. With heavy eyelids we would straight get into our kids room and I bet our mother’s would have been happy to see us naughty ones to doze off leaving them enough free time to take nap in the afternoon. Even today I just have to close my eyes to see my Ajji smiling at us, ready with platter full of munchies when we would get up from our nap and ready to go out for playing. Memories of her face, her smile, her soft, wrinkled hands, her bright, sparkling eyes, her perfume, our weekend oil baths, and her delicious food is very fresh in my heart. One of my favourite food memories from my Ajji’s kitchen is Huli-Menasina Kodhel. It’s a typical Udupi-Managalorean curry made using very few ingredients and its one of the finest example as how simple food cooked with very few ingredients can taste utterly delicious. While Byadagi Menasu gives that fiery red colour with kick of spiciness, tamarind gives it much needed tang. 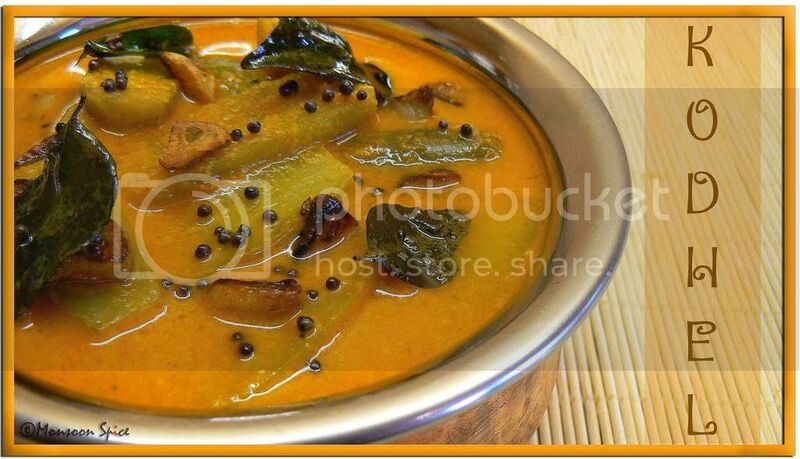 Coconut and Jaggery makes it creamy, a hint of sweetness and pungent Garlic tadka takes it to another level of taste. Huli-Menasina Kodhel is usually made using Yellow Cucumber or Tindora/Tondekai or combination of both and is a very special dish for me, from my native. Coming from a Brahmin family who followed very strict vegetarian diet, we kids would imagine that Tondekai/Tindora as fish and annoy our elders. Ajji would laugh at our wild imaginations and made sure to cook this Kodhel during weekends for our pleasure. Even now when I cook this Kodhel, I can’t help but think of my blissful childhood days with dozens of cousins. I am sending this special dish to this month’s Jihva for Love which is guest hosted by Jigyasa and Pratibha who have started this beautiful blog A Tribute to Pedatha. Take a pan with 3-4 cups of water and bring them to gentle boil. Meanwhile, wash, dry and trim the ends of tindora and halve them horizontally. Add these tindora pieces into boiling water along with jaggery, turmeric powder and salt to taste. Cook uncovered on a medium flame for around 10-15 minutes till they are half cooked. Grind coconut with tamarind, dry red byadagi chillies and cumin seeds to smooth water adding little water at time. Add this ground paste to cooked tindora and mix well. Cook on a medium to low heat for about 10-15 minutes and bring the curry to gentle boil and turn of the heat. Adjust the seasoning as per taste. Heat oil in a pan and add garlic slices to it. Sauté till garlic turns golden yellow in colour. Add mustard seeds, dry red chilli and curry leaves and sauté. Once the mustard seeds starts to pop and splutter transfer the tempering to Kodhel and mix well. Serve this Huli-Menasina Kodhel with steamed rice or Dosa or Idli and enjoy. The bright red beautiful colour of the curry is due to special type of Chilli used called Byadagi Chillies. They are milder in compared to other chillies and gives beautiful red colour to the curry. 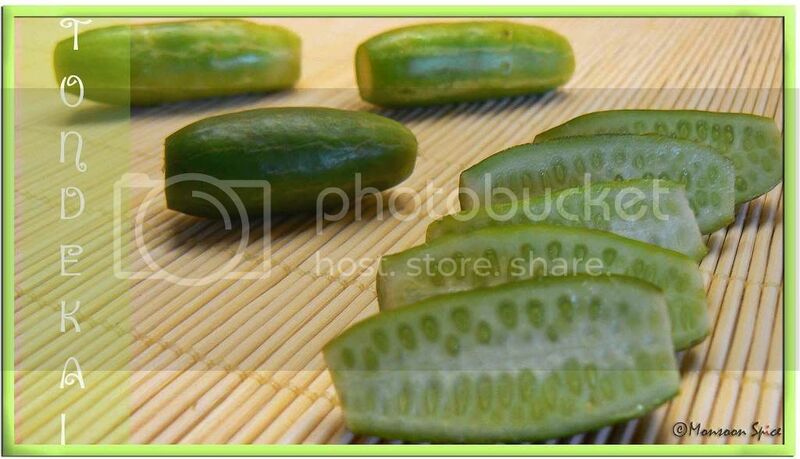 Use Dosekai/Yello Cucumber in place of Tindora or mix both the vegetables in equal quantity and follow the same recipe. Garlic is a must for this Kodhel as it gives Kodhel wonderful flavour. I can't wait to buy Tindora now...mmmm looks fabulous Sia! What a lovely post, Sia. You transported me to another time and era. I have to try this recipe soon. While reading your post i could imagine the bathroom you described. In my dads parents place it was also like that. The bathroom was away from the house. Which for me when i was little i didn't lik it as i always asked my elder sister to come with me as i was afraid to go alone . Sups!! What an amazing way to describe the beauty of your Ajji!Hats off my dear, I could clearly visualise as if its happening in front of me now!! And to end with that amazing curry using tondekai. I usually fried tondekai with coconut or chutney but never tried a curry Sups. I will definitely give it a go!! Thats a yummy curry! 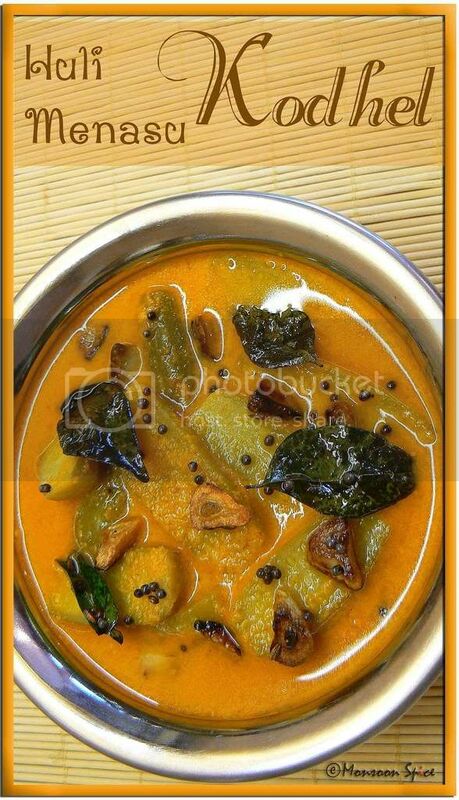 pic too looks very delicious..
OH WOW ... looks tasty kodhel. Nice pics...when i'd tried Asha's koddel powder it is super and you have mentioned to try beetroot knw it is also good yummy recipe. Love tindora..so far i have not made curry with it. Nice masala with coconut. Will try when i get some fresh tindora. that looks yummy :) . Reading about your ajji even I can say what a pretty lady she might be .Pretty from heart too :) . "Magar mujko lauta do bachapan ka savan woh kagaj ki kashti woh barish ka paani... " . I love how evocative the names are!! Absolutely yum - to eat, to look at and even to think of! The curry looks awesome. I make it in a different way. your ajji sounds like a warm and wonderful lady, sia. it's sad that you didn't get to spend more time with her. delicious, sia! lovely pic. what a nice way to cook tindora! Awesome. The picture itself is too tempting..nice to hear ur nostalgic memories..
like the garlic tadka on top, would like to make this rcp! The color of the curry is amazing and its a treat for me, tindora being one of my fav vegetables! Such a beautiful description of your childhood memories Sia - and a recipe to match! I just love the way you write! makes an interesting read! Dearest Sia, I'm speechless except to say, thank you for sharing this beautifully written remembrance. This speaks to my heart and reminds me of my own memories of childhood -- happy memories I hope my kids will have, too. Ohh..those golden fried garlic's are tempting me to taste!!! What a wonderful post! You reminded me of my Ajji (maternal grandmother), even the description matches...the silk saree, jasmine flowers, knotted bun, kumkum and ofcourse especially the bath routine. I was fortunate enough to have had her company for a longer time. I will definitely try this recipe very soon. That was one lovely and beautiful and interesting write abt your grandma.You reminded me of my childhood days.Thankyou for sharing. Yummy curry! Cant wait to try your recipe. Such a beautiful tribute to your grandmother, Sia. She sounds very special indeed, and I love how lovingly you describe her. Thanks for sharing this very special recipe. Are we related? 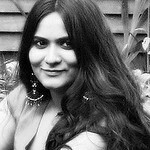 My Ajji was the so similar and she was from Mangalore too. She died about 15 yrs ago. I really miss her cooking and regret that I never learned any of her cooking. My Ajja died 2 yrs ago at the age of 103. How I miss my Ajja and Ajji and ofcourse Mangalore after reading your post. Thanks for bringing back sweet memories. Sups, this is so beautiful.....your decsription of your Ajji and the vivid painting with words, took me a lil' journey through time. Lovely koddel, have to find some tindoras now. Beautiful narration and pictures as always! I am in awe of your distinct memories and the way you write! Loved the write up about your Ajji and that instantly brought back memories of my own Ajji. sniff! sniff! Naani yaad diladi tumne Sia!! I want my Naani!! I miss her!! My Granda has the sweetest expression on her face and the gentlest hands and a world of wisdom! The recipe sounds like a winner.. will try it!! That's a very sweet post. A wonderful tribute to your grandmother. i miss my both grandmothers too. Sia - thanks for that recipe! I've started trying almost everything from your site. Love Mangalorean food and your blog is a treasure! Ah! Reminds me of a long, long time back. Of childhood days at Mysore. Don't speak too much Kannada now, but some of the words brings back sweet memories of simpler days. We loved your huli menasina kodhel very much.. trust me..tindora never tasted this good before:) .. It had absorbed the favors so well.. just perfect.. My husband's comment and I quote -" without a doubt, this is THE best tindora dish I have ever had".. I would like to thank you for sharing all your WONDERFUL recipes here.. Its really of great help for a novice like me. I would definitely like to keep coming back and try more and more recipes from your blog. Will keep you posted:). Thanks again.